Here's the latest in an ongoing series of thoughts. I suppose I always take an overall view of 'debates', trying to unify them under a small number of headings. The problem, seemingly, with the pattern language view of go (as pattern language of lines of play) is not that it is seriously wrong. In fact it seems to me no distortion of the facts. The difficulty lies in using it to teach. What the go pupil usually appreciates isn't access to the 'pattern language' point of view, which consistently answers a question with a question (if not several). It is some reified concept: a thing that one can learn separately. One supposes that it includes the essentials of the lines of play that one cannot or will not study in their own right. The very first example, that of reading ladders, shows this. 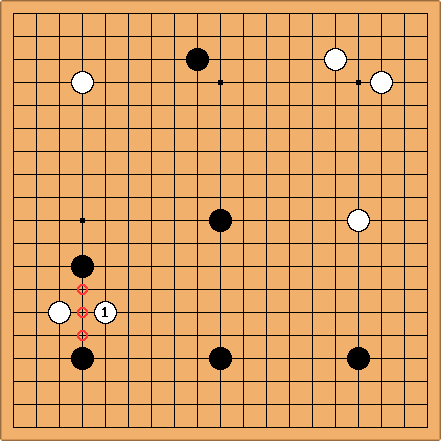 Kageyama is scathing about the precomputed approach: some number of imaginary diagonal lines on the board. In Lessons in the Fundamentals, a book I like more on a metaphorical level than as containing factual information, he says rather clearly: read it out. This is a narrow way into the discussion, perhaps. But the message is clear: elevating some geometric construction on the board over the (single, unbranched) line of play one should be considering does one's game no service. This kind of reification is ultimately fallacious. A second example is the sector line. I think of the sector line concept as the interferon of go theory: the background in principle is impeccable (frameworks are convex), but the actual area of application is rather small and delimited. This game position was posted by LovedInEmerald. Here creates a short sector line of the circle-marked points. It also creates a longer one, roughly indicated by the square-marked points. I do find it helpful as an explanation that breaks a short sector line. The chosen pincer does aim to connect across this very line; cuts the pincer stone off, leaving it a little too close (see intermediate distance). The short sector line concept builds on the small gaps idea. It isn't correct to conclude from this that sector lines always work as a description. Frameworks may become concave in the face of the opponent's strength; they may be considered as more convex in favourable conditions. Another type of example involves the kind of issues I thought I was addressing at thickness cycle. Two things that are indubitably there in pro play are thick ways to play and the conversion to profit of thick(er) positions. On that page I talk about Thickness I and Thickness II. Here I'd like to point out that Thickness I is a sort of reified form of Thickness II. For those who want to know where Thickness II lies on the board (not in the lines of play), one gives the kind of traditional, slightly lame explanation: there is Thickness I which is a kind of perfect group; clearly if you are attacking this is the sort of low-maintenance group you like to have; you take extra profit in go by attacking; so in a sense a thick group resulting from a joseki gives concrete form to one's attacking chances, even though they may lie 100 moves in the future. Further examples: shape is reified haengma. Now, I think shape study is important; what this says is, it is also self-limited by its static patterns. That is true, too, in my view: shape is very good for teaching purposes, but rarely the whole story. And the whole liberty discussion here at SL, also: there seems to be a pressure that builds up to map capturing sequences in capturing races onto something called liberties. We reify into approach moves and so on. This is scarcely surprising: six dame liberties to fill can be filled in 720 ways, and we want to deal with all those lines together, mentally. The fact remains that this is something we impose. Something of an intellectual full circle on the pattern language approach, therefore. Trying to bypass it leads down the road that takes one in the end to memorisation of joseki (even, these days, of set fuseki ). One's mind then fills up with constructions, patterns, diagrams: data not inherently required to play (if one can really play). On the other hand the proverb approach in many cases is unsatisfactory, too: the proverb applies only under conditions that are lengthy to explain, and involve higher concepts. 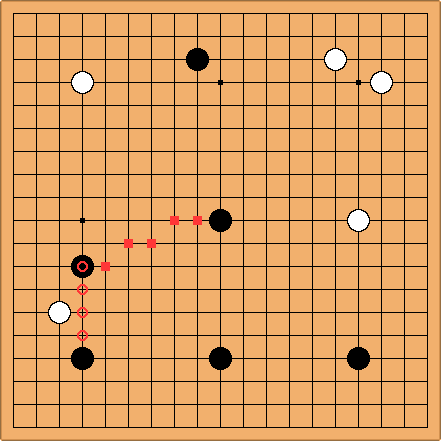 Perhaps the point is that looking for a proverbial royal road is always going to fail for go. In the end most well-played games come to a close in the way that a great river reaches the sea: through a complex delta of many channels. Maps may not exist. John F. Now there's a blow! Here am I sitting in the sweltering heat of London, mildly comforted by a fan written by O Rissei. I had hoped (by a process of reification, no doubt) that the sentiments behind the motto might waft into me. The motto? Royal road. Of course, O did lose to Sasha, so Charles is probably right. Charles Not a bad example - unless Alexandre's commentary is unduly modest, he got lucky in the endgame. The concept of a lead, as in a lead of five points, is quite important: we can't play without using positional judgement. But sitting on a lead isn't by itself a winning plan. O fell into the trap of passivity: it has been known, certainly, for pros to get angry with themselves after doing that. Michael S Nevertheless, pattern language may easily be called the royal sceptre. Pure reading power is a limiting factor even for pros. Guideline ideas must ultimately answer to reading, yet human improvement is only possible with both reading and er, abstract principles (r checks p, p informs r, r practices r, p alters p). In this view, no one would want to reify an abstract concept except by read-verifying it on an example case. A proverb is only a textual representation of a principle. Together with examples, the hope is a student will 'lift' this information to an abstract idea, though results may vary. Once someone is comfortable with saying the like of "Proverbs are proverbs", why not, apart from emphasis on reading, embrace teaching pattern language? Word choice can help us all be more open to transitioning from rule obeying to rule verifying/creating, e.g. "Check the tiger's mouth" instead of "Play the tiger's mouth." I think the main problem is that abstract concepts and their wording are overwhelming. Also, a comment triggered by the sector line example: imo territorial frameworks are very much concave (i.e. any secure territory is far behind the framework's sector line) until the end of the game. Perhaps somewhere there are boundaries of influence which could define a convex framework. I would say geometric constructions like sector lines are indeed naive...in summary of such a discussion, we might wish we had instead spent a fraction of the time thinking of (or improving) the principle "Frameworks have Boundaries! Hooray!"